The basic specifications of the music single were set[vague] in the late 19th century, when the gramophone record began to supersede phonograph cylinders in commercially produced musical recordings. Gramophone discs were manufactured with a range of playback speeds (from 16 rpm to 78 rpm) and in several sizes (including 12-inch/30 cm). 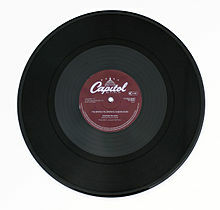 By about 1910, however, the 10-inch (25 cm), 78 rpm shellac disc had become the most commonly used format. With these factors applied to the 10-inch format, songwriters and performers increasingly tailored their output to fit the new medium. The 3-minute single remained the standard into the 1960s, when the availability of microgroove recording and improved mastering techniques enabled recording artists to increase the duration of their recorded songs. The breakthrough came with Bob Dylan's "Like a Rolling Stone". Although CBS tried to make the record more "radio friendly" by cutting the performance into halves, and separating them between the two sides of the vinyl disc, both Dylan and his fans demanded that the full six-minute take be placed on one side, and that radio stations play the song in its entirety. ^ "Beatles Singles Discography". University of Delaware. Retrieved 2019-03-29.